Please note that this workshop is also offered for Microsoft Office 365/2016. While this workshop is ideal for users who want to take their Microsoft Office skills to the next level. In this condensed session, users learn powerful techniques that can help them save significant time when using the Microsoft Office applications, present information in a compelling way, analyze data and extract important business insights, and collaborate more effectively with others. We start with Outlook and show some tips and techniques relating to flags, categories, search folders, rules, tasks, and calendar, and then move to PowerPoint to demonstrate templates, themes, and layouts. Next we move to Excel to see some of the powerful lists and reports capabilities, and then Word for some advanced styles and formatting tips. Finally, we'll explore useful overall options and preferences. 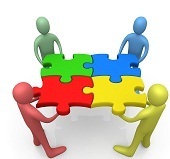 Collaboration Technologies: Blogs, Wikis, SharePoint, and more!